Classically Liberal: Cuba Takes a Big Step Away from Socialism. Cuba Takes a Big Step Away from Socialism. Cuba's socialist dictatorship has announced that it will be taking some huge steps away from socialism. Just days ago Fidel Castro admitted that the Cuban model wasn't working for Cuba, though he backtracked on that after his comments got widespread attention. But more importantly the dictatorship, now run by Fidel's brother, Raul, has announced steps that indicate that socialism is one the way out in the Cuban Marxist paradise. The Cuban government has said that it will be firing at least half a million state employees. And they indicated that the total number laid off could reach 1 million. The official employment numbers in Cuba show that 5.1 million people have jobs. At the moment 10% of all the employed could be laid off by early in the new year. The government will loosen regulations restricting private employment hoping to take up the slack. Individuals will be allowed to form cooperatives or be self-employed. The only legal trade union, which is run by the Communist Party, says: "Our state cannot and should not continue supporting businesses, production entities and services with inflated payrolls, and losses that hurt our economy are ultimately counterproductive, creating bad habits and distorting worker conduct." The problem is that 95% of all employees work for the state and the state is inefficient when it comes to producing wealth. This means the average wage in Cuba is $20 per month. 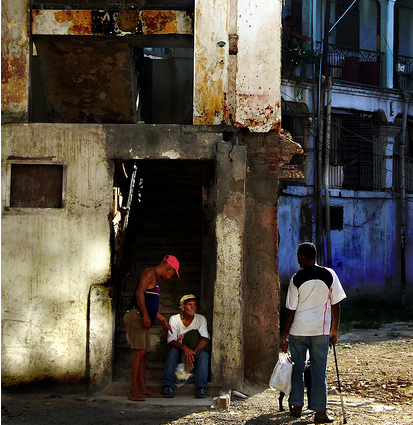 Cuba needs reform but reform is not easy. The collapse of socialism in the Soviet block showed that change is not easy and that even good reforms can have short term bad consequences. Centrally planning reform is as difficult as centrally planning an economy. Big steps sometimes works, sometimes many small steps are better. Russia had to take big steps to change but people had become used to the old system and found ways to work around problems. Reforms sometimes meant that the loopholes no longer worked and that made some areas less efficient. China, as totalitarian as it is, has taken many steps in the right direction and an an accelerating pace. There is now a vibrant private economy there to take up the slack. But if Cuba lays off 10% of all employed people it is unlikely that the tiny private sector will be able to absorb them fast enough. The reforms Cuba announced are needed but should have come before the layoffs, not after. People do not understand how devastating it is when a socialist system falls apart, as all socialist systems eventually do. When I was in Bulgaria a few years ago the socialist safety net had collapsed completely. I watched old women begging on the streets or trying to sell pathetic bouquets of flowers in front of the cathedral in the hope of earning just a few cents. It broke my heart. One sad women clutched her tiny bouquet with a hungry look on her face. I counted all my money, leaving just enough to take a taxi to the airport in the morning, and gave the full amount to this woman. In dollar terms it was just a few dollars, for her it was days worth of income. She grabbed my and and started kissing it and crying. I could barely watch. This is the danger of centralized state control. As bad as it is when one business goes under imagine what happens if they are all run by the same body of men and that body falls apart. The private sector works better because it is larger with many sectors. Weakness in one area doesn't mean destruction of all areas. But when you rely on one body, and when that one body has wiped out competition in the form of other bodies providing goods and services, you are in very risky situation. The old saying is that one should put all of one's eggs in one basket. Socialism is putting all eggs in one basket—the State basket. But socialist states collapse. With them the entire health system collapses, the education system falls apart, housing falls apart (literally), jobs disappear and the tiny pensions that many elder have come to depend upon completely disappears leaving them in the streets to beg. Yet people justify socialism on the basis that it prevents the very thing I saw in the former socialist republics. Socialism is like drunk driving, everything goes fine until it doesn't and when it doesn't you have a major mess on your hands. And like drunk drivers eventually things will hit the wall. If the communist system in China disappeared the country could probably weather the storm because it has a vibrant private economy today. Cuba, which stayed true to socialist teachings, in spite of evidence telling them not to, has no such private sector. And I question whether it can build one fast enough to soften the blows of the necessary reforms. posted by blog owner at 9/14/2010 02:18:00 AM DiggIt! Reddit Del.icio.us Slashdot It!